First in a multi-part series AT THE MILL. According to one account the millpond was 18.2 acres and the Ben Smith impoundment between the dam and White Pond Road bridge was 18.8 acres. Then genius of Amory Maynard was to separate the mill from the dam. By doing so, a large dam could be constructed upstream from where a small dam was, at Mill Street, and the new woolen mill located downstream. This separation created a larger vertical drop. And as water power is created by a combination of volume and vertical drop, more power. By creating the Ben Smith Dam, connecting canal, mill pond, and securing water rights upriver, including to Boone Pond and Fort Meadow Pond, the mill was able to operate year-round with a volume of 100 cubic feet per second, equivalent to 50,000 gallons per minute, and a vertical drop of close to twenty feet. mill pond much larger then compared to today. Click on photos to enlarge. Canal enters pond from left. Water exits under mill to river on right. Power production was on the order of 50 horsepower. Not much, which is why not too long after the railroad reached Assabet Village the mill was adding coal-fired steam engines. 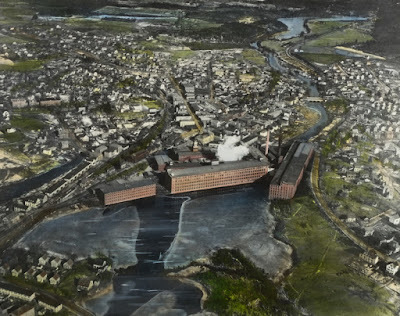 By 1879, the year the aerial view image of the center of Maynard was published, the mill complex had grown to six major buildings and two smokestacks. Water was still essential for the steam engines, and to wash the raw wool and the finished cloth after the dyeing process. 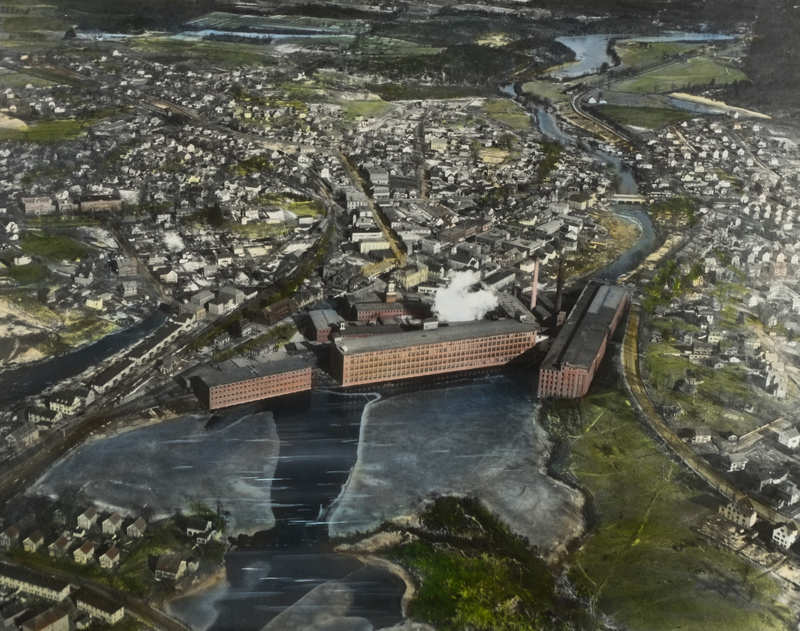 The aerial view shows a much larger mill pond than we have now. Size was not essential to maintain an adequate water reserve, as the canal connected the mill pond to the much larger body of water held back by the Ben Smith Dam. Through the years, various projects nibbled away at the pond. The three large mill buildings fronting the pond are partially over the water, and actually required draining the pond in 1916-18 during construction of the last one. When this was taking place a trestle and flume (large wooden pipe) crossed the drained pond from the west side. This was to provide water necessary to wash and process the wool. The trestle had still been relatively intact during a partial pond draining back in 1977. Remnants of the trestle can be seen protruding above the water’s surface when the pond level drops in summer. conveyed water to the mill. Courtesy Maynard Historical Society. West of Sudbury Road, land was filled in for construction of the school that was associated with Saint Bridget Parish. A large part of the south side of the pond was filled in to create the parking lot that extends to Building 5 (Stratus Technologies and Battle Road Brewery). Land was created on the north side for the parking lot that serves as the site for the Maynard Farmers’ Market. Before the 2008 recession, Wellesley Management, the past owner/operator of the mill complex, had proposed to build an office building on the south side, and either a multi-level parking garage for more than 1,000 cars, or else fill in much more of the pond for parking. This did not come to pass, but clarified that the owners of the mill own the pond. One restriction on the pond owners is that water cannot be diverted from the river to the millpond when volume in the river drops below 39 cubic feet per second. Riverside CO-OP building (burned Jan 1936) is in photo. The amount of water in the pond is controlled at both ends, a gatehouse on the canal for flow in, and a similar gate near the end of Building 3 for flow out. This past summer, Mill & Main had some problems with the pond mysteriously filling to overflowing despite the summer drought and despite periodically letting water out. Problem solved when water was observed entering at the gatehouse, with an estimated round-the-clock inflow of 10,000 gallons per minute. Scuba divers were hired. Turns out that a tree stump had become wedged in the opening, preventing the gate from closing completely. 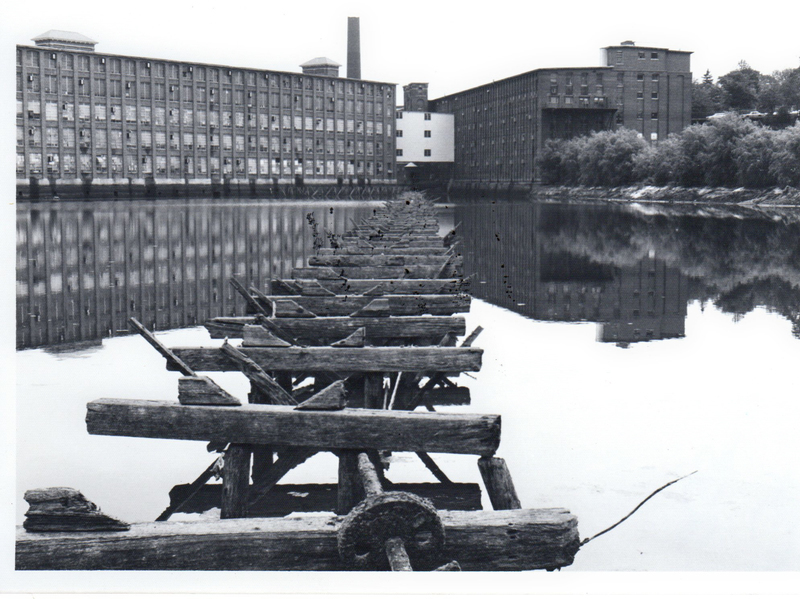 Back in the day of looser regulations and liabilities, the mill pond provided recreational opportunities for residents of Maynard. People fished, boated and swam. The pond, fed by water from the river, was far cleaner than the river downstream of the mill’s discharges. But not entirely clean, as upriver, Hudson, Stow and other towns were discharging their own mill wastes. Even so, an ice house was filled with ice every winter. Ice skating took place, with the occasional fall-through, and either rescue or fatality.